The mint julep is a mixed alcoholic drink, or cocktail, associated with the cuisine of the Southern United States. 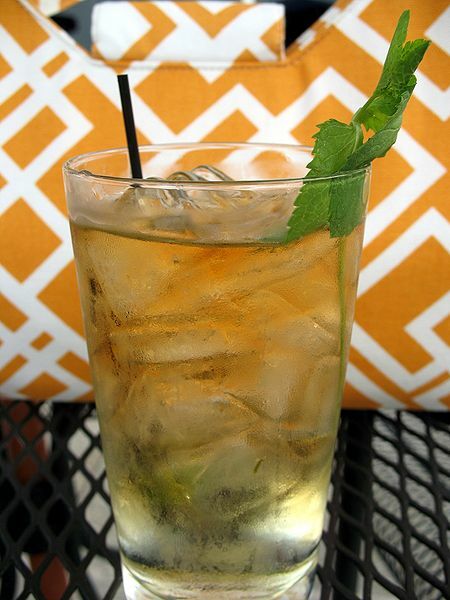 A mint julep is traditionally made of four ingredients: mint, bourbon, sugar, and water. Traditionally, spearmint is the mint of choice used in Southern states; in particular, Kentucky Colonel. In the use of sugar and mint, it is similar to the mojito. In preparing a mint julep, a fresh mint sprig is used primarily as a garnish, to introduce the flavor and aroma through the nose. If mint leaves are used in the preparation, they should just be very lightly bruised, if at all. However, proper preparation of the cocktail is commonly debated, as methods may vary considerably from one bartender to another. By another method, the mint julep may be considered as one of a loosely associated family of drinks called "smashes" (the brandy smash is another example, as well as the mojito), in which fresh mint and other ingredients are muddled or crushed in preparation for flavoring the finished drink. The step further releases essential oils and juices into the mixture, intensifying the flavor from the added ingredient or ingredients. The mint julep originated in the southern United States, probably during the eighteenth century. Americans enjoyed not only bourbon based juleps during the nineteenth century, but also gin based juleps made with genever, an aged gin. However, bourbon based juleps have recently decisively eclipsed gin based juleps. Put mint, sugar, and a small amount of crushed or shaved ice into the bottom of a julep cup or tall glass. (Optional: Muddle the mint and sugar, then let stand for a bit to allow the broken leaves to release their flavor.) Add bourbon whiskey, top off with crushed or shaved ice, and stir well to mix and chill the mixture. The Kremlin Colonel is made with vodka instead of bourbon; the fresh mint flavoring differentiates the drink from the similar vodka Stinger that uses crème de menthe.